TRED 4x4 is the ultimate all-in-one off road recovery device, specially designed to get your four-wheel drive, ATV and equipment out of trouble when traction is lost in sand, mud, sludge, slime or snow. When Team Desert Rat was equipping the truck for the 2017 win at the NORRA 1000, TRED was the choice to make sure getting stuck didn't put them out of the race. 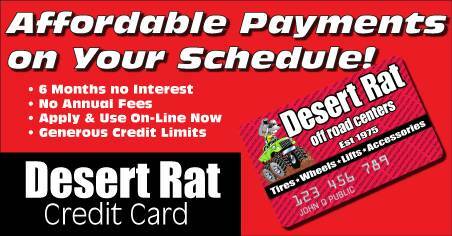 Let the professionals at Desert Rat Off Road Centers help you outfit your off road vehicle with the gear you need to enjoy all off roading has to offer. Engineered and manufactured in Australia from only the highest quality materials, TRED's are designed to handle intense levels of torque, flex, weight and impact. Intense reviews of every fine detail in the design process make TRED 4x4 the best choice for your recovery. With a designated shovel feature, extreme hex grip nodules, aggressive ramp entry teeth and ultimate wear resistant properties, TRED 4x4 will allow you to explore with confidence, without letting traction disrupt your journey.